Lose weight without following government protocol. Eating and dieting doesnt have to revolve around the governments Food Pyramid. Learn how to lose weight by following the Atkins food pyramid thats the foundation of the Atkins Diet weight loss Program. The Atkins Diet went against political mainstream, toppled over the food pyramid, and mixed up the pieces like a Rubiks Cube. 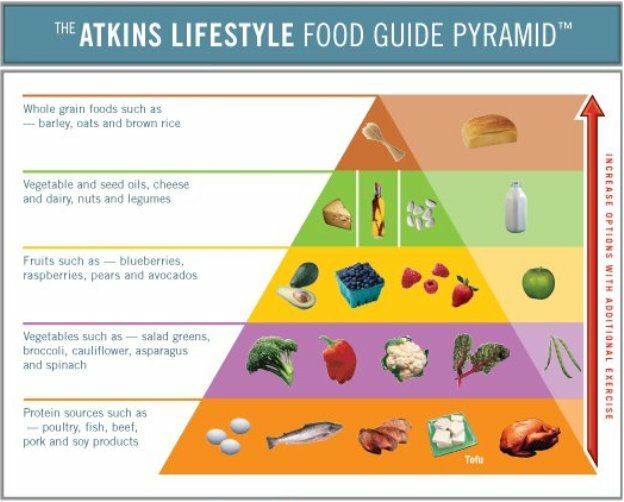 Atkins took the carbohydrates that were recommended as a foundation to healthy dieting and eating and brought them to the tippy-top of the food pyramid demonstrating that eating too much of these were detrimental to healthy dieting and eating if you want to learn how to lose weight. Meat and proteins are the foundation of the Atkins Diet weight loss Program and if you want to learn how to lose weight – you simply rearrange your dietary eating plans to the Atkins low-carbohydrate weight loss pyramid. The governments 2005 food pyramid now runs horizontal rather than vertical, however the concept is the same. Grains, vegetables, fruit, oils (from fish, nut, and vegetable sources), dairy, then the protein group of meat and beans run left to right rather than bottom to top. The shape changed and the icon now includes a person exercising, but the concept is the same. The food pyramid in the Atkins Diet suggests a different hierarchy if you want to lose weight. The foundation is the protein found in meats and eggs, a complete opposite of the governments suggestion for healthy eating habits. Vegetables and fruit follow, then nuts and dairy – then grains. The Wall Street Journal reported in 2002, before the new food pyramid was introduced in 2005, that obesity in America grew 61% with onset of the governments suggested food pyramid. Americas obesity problem may be more a result of the governments diet suggestions, rather than the increase in video games. It may take more than an icon of a person exercising on a set of stairs to help America eat healthy and lose weight. Dieting is personal. The amount of weight a person needs to lose, their accompanying health problems, genetics, and even the environment, all play a part in a dieters success with their weight loss program. losing weight, or even just eating healthy, takes a lot more than a pyramid to guide you. Atkins food pyramid expounds on the contributions that exercise makes to weight loss. He includes a sidebar on the food pyramid that indicates which foods can be eaten in larger amounts as ones exercise program increases. The Atkins Diet Weight Loss Program suggested a radical change in eating habits at its time of introduction to the dietary world. Today, Atkins is a leader of protein-rich diets. Eating habits have changed over the years, and so have the food industries influences on the healthy eating habits suggested by the government. Atkins wants people to lose weight with healthy eating habits. The governments program merely led people to gain weight. You and your unique needs should influence diet and eating plans. Look into your eating habits, and decide which plan is the best for you to lose weight now. Learning how to lose weight might be as simple as losing the food pyramids and looking at your diet and eating habits. Topple the pyramids and lose your weight now.